The Caribbean Centre of Excellence in Mathematics Teaching (CCEMaT) is a research institute of The Mico University College formed to conduct research and training with the ultimate goal of improving the quality of mathematics education in Jamaica and the wider Caribbean. CCEMat was formed in collaboration with the Centre for Innovation in Mathematics Teaching (CIMT) at the University of Plymouth in the United Kingdom. CCEMaT's mandate is to conduct research and training/teacher-preparation activities designed to improve the quality of mathematics education in Jamaica and the wider Caribbean. CCEMaT is committed to research and outreach focused on issues relating to mathematics teaching and learning including mathematics teacher education. CCEMaT's vision is to become regional leaders in research and curriculum development that relate to mathematics education. CCEMaT's mission is to support national and regional development through research and curriculum development in mathematics teaching and learning designed to inform and enhance mathematics teacher education and mathematics education at the early childhood, primary and secondary levels. Education is one of the significant contributors to national growth and development. The provision of schooling is one of the most massive and ubiquitous undertakings of the modern state. Schools are universally regarded as vital instruments of social and economic policy aimed at promoting individual fulfillment, social progress and national prosperity. With the onset of globalization, education has taken a more prominent role with increasing significance on ‘…knowledge fields connected to the market such as mathematics and science; pedagogies oriented toward problem solving. Considering the increasing importance on education in the individual and national development and the increasing importance of subject areas such as mathematics, there is need for concern regarding Jamaica's ability to compete in the increasingly global marketplace. A review of data generated from the administration of the Grade 3 Diagnostic Test, Grade 4 Numeracy Test, Grade Six Achievement Test (GSAT) and Caribbean Secondary Education Certificate (CSEC) Mathematics examinations shows a consistent trend of low performance in the subject. Between 2004 and 2006, the percentage of students in the relevant age cohort who were able to master all four stands of the curriculum on the Grade 3 Diagnostic Test, ranged between 4.0% and 15% (National Mathematics Strategy 2008). In 2009, data generated from the first national sitting of the Grade 4 Numeracy Test showed that only 43% of the sitting cohort was able to master all five strands of the curriculum. This figure fell to 37% in 2010. 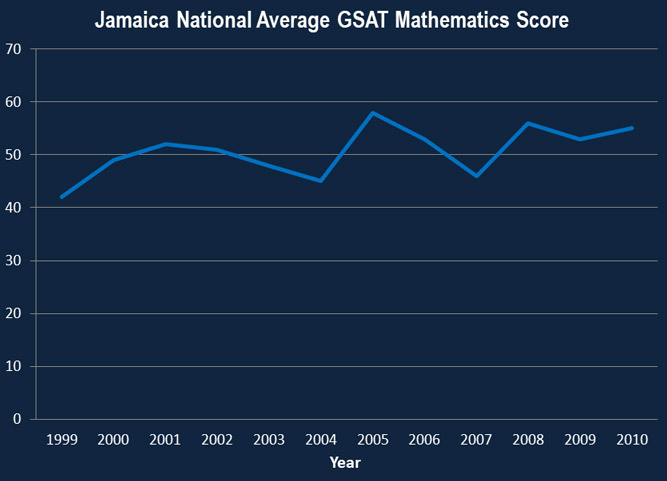 Analysis of the data generated from the administration of the GSAT continues to show the low levels of performance in the subject. Data from 1999 – 2009, shows the national average for the subject, ranging between a low of 42% in 1999 and a high of 58% in 2005 (Table 1). The data presented includes results for privately run primary level institutions which receive no funding from the government. When the data is disaggregated, there is an approximate 8 – 11% fall in the national average indicating that the performance of government run schools is actually lower than the stated average (National Mathematics Strategy, 2008). Therefore less than half of the students in government run primary schools are able to master primary level mathematics concepts which form a critical part of the foundation needed to successfully access the secondary mathematics curriculum. Currently at the secondary level of the education system, the Caribbean Examinations Council's (CXC), Caribbean Certificate of Secondary Education (CSEC) Mathematics examination is the only official/national benchmark against which student performance in mathematics at the secondary level is assessed in Jamaica. Data obtained from the Ministry of Education indicates that between 2007 and 2010 approximately 36% of the sitting cohort was able to attain a Grade I, II or III (a passing grade) on the examination. This translates to approximately 13% of the age cohort, leaving secondary school with an accreditation in secondary mathematics – a key qualifier for students to be able to access tertiary education. The data reveals the need for critical intervention within Jamaica. A review of data for other Caribbean territories such as St. Lucia shows that particularly at the secondary levels, trends are also showing low levels of student performance in mathematics. There is a need for much research to provide guidance in the developing policy and programmes which are designed to improve the teaching and learning of the subject. CCEMaT has been developed and is positioned to fill the gap which currently exists in Jamaica and the wider Caribbean in this regard. The main aim of the research agenda should be to frame the Jamaican and Caribbean society's agenda in mathematics education. The Mico through CCEMaT has a golden opportunity to set his on the national and regional agenda. Position 7: Research on technology to support learning across the curriculum in content areas at the primary, secondary and tertiary levels. CCEMaT is managed by a steering committee Chaired by Professor Claude Packer – President of The Mico University College. Other members of the steering committee include Dr. Bermadee Briscoe (Dean of the Faculty of Science and Technology), Dr. Albert Benjamin (Head of Department of Natural Sciences), Mrs. Novlet Plunkett (Head of the Mathematics Section) and Mr. Donald Rose (E-Learning Project Manager). The centre is directed by Dr. Tamika Benjamin.